Most Glorious Leader Kim Il Sung brings the people of the DPRK much success from beyond the grave. I think comparisons to Nazi Germany are overused. Comparisons to North Korea, however, are still fair game. Pyongyang is North Korea’s capital. It is a city located towards the center of a country mired in famine, propaganda and gulags. 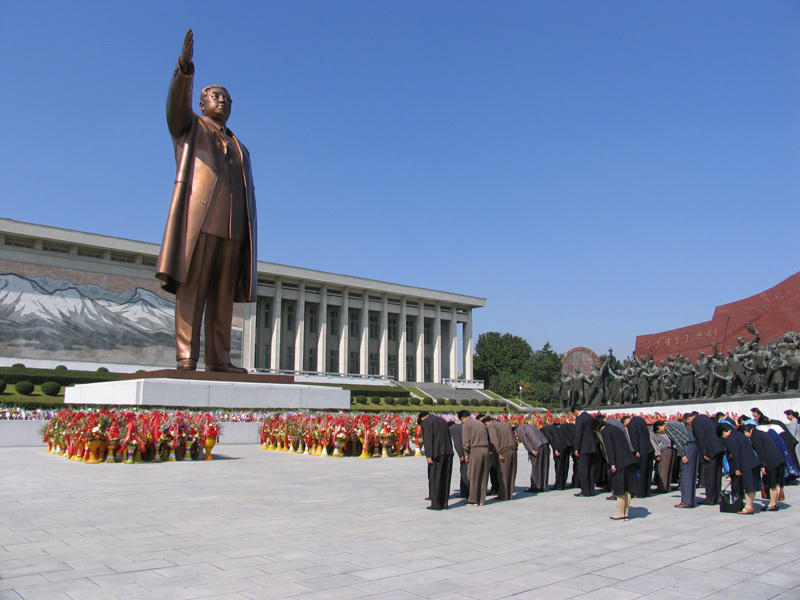 Foreigners who visit North Korea are given a “guided tour” by state-employed handlers who take you around to see the most glittering parts of the city: the giant statue of Kim Il Sung, the underground rail system, the beautiful traffic ladies and the cooperative farms on the outskirts that are greener than all the other farms in the land. Those who live in Pyongyang are the elite living a relatively privileged life due to the largesse of the “Dear Leader”, or whatever Kim Jong Un is called. Although these elites still have limited food and frequent power outages, it beats the hell out of starving in the countryside or eating rats in a forced labor camp. Pyongyang is the showcase city. This is what happens when a dictator with absolute control runs a small, isolated nation. And here we have Michael Bloomberg, the Kim Jong Un of New York City’s Department of Education. He abolished the democratically-elected Board of Education to replace it with his Politburo, er, I mean Panel for Educational Policy whose members only answer to him. He has ravaged the countryside, er, I mean schools under his control through indiscriminate “restructurings” and “turnarounds”, leaving husks of institutions in their wake. New schools founded in the last three years get more money per student than schools the city began shutting down this year, a Daily News analysis finds. Under a reform — ironically called Fair Student Funding — the city distributes the bulk of school funding based on the enrollment and demographics of each school. The reform introduced in 2007 hasn’t been fully funded because of budget cuts in recent years, but all 30 new schools opening this year get their full share of the money to which they’re entitled while the struggling schools remain badly underfunded. “Showcase schools”, that says it all. This is “Fair Student Funding”. It reminds me of the “Great Leap Forward” in China where millions died of famine. That is exactly what it is too: famine. In order to fatten up the schools with loyal administrators and younger (see: cheaper) teachers, the schools in the countryside with more veteran staffs get nothing. They starve for resources, having to nurse a piece of chalk for days or limit the copies they make to save paper. Those who speak against his regime, or just plain make too much money, are disappeared, charged with phony crimes, hounded by his education police and put through a kangaroo show trial. Of course, like all dictators, Bloomberg takes no credit for these disparities in funding. This despite the fact that he claimed he would have “all the accountability” for what went on in schools once he seized control of them. “Efforts to raise all schools to 100% of the Fair Student Funding formula continue to be implemented gradually, and have been hampered by the five successive years of budget cuts during the recession,” said Education Department spokesman Connie Pankratz. Adding to the budgetary slight, the turnaround schools were supposed to receive an additional $31 million in federal school improvement grants. City officials said in August they would provide the schools $18 million to help offset the loss of the grant. That is right, it is not his fault. It is the state and federal government not putting up the cash. That is Pharaoh Bloomberg’s way of being “accountable”. It is an “embargo” from the state and federal governments that Bloomberg blames. If you buy that excuse, there is an isolated dictatorship in east Asia waiting for you to move there. When the historians finally get to work on the Bloomberg regime, they will see that his policies have meant desolation for the students, teachers and parents of New York City. This entry was posted in An Embattled Career, education reform, School, teaching and tagged Daily News, education, Educational Inequality, Fair Student Funding, New York City Department of Education, Pharaoh Bloomberg, Schools. Bookmark the permalink. …just wondering in what way you used crude and why you would say this essay is crude, or these ideas and references ( if that is what you are referring to…). I am sure of it. Maybe it’s stupidity on my part. Time will tell. When..I first saw…the title of this piece-I thought to myself-how is he gonna take this and spin it into an Education piece?? Well, I have to say, I was pleasantly suprised…so did not see this coming. Your comparison is head on…and completely and utterly brilliant. Ahhhh….the good old Pharaoh has a new name..Bravo! I really…love this piece! And just like a petty despot, Bloomberg said that he had his own army in the NYPD. nice essay!!! it is crucial to look at the politicized public education system as destroyed by the business takeover. And the businesses are who runs the dictatorship here in the United States.